In the car industry the SpraySpy® technology can be used to develop and test new lacquers or nozzles. Furthermore, the equipment manufacturer can use the SpraySpy® technology for non-destructive and real-time spray process quality monitoring. Using SpraySpy® the spray process can be monitored inline during the production process. The relevant safety measures for the car industry production processes can be fulfilled. Working under ATEX and/or a high voltage environment is possible. 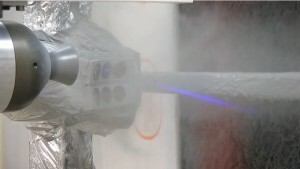 Video of droplet size and velocity measurement of automobile paint with the SpraySpy®-technology. 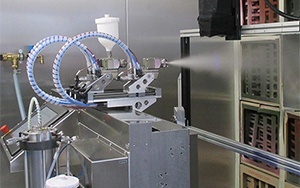 The spray was created with a rotary atomizer (BetaBell – with friendly support of LacTec GmbH). Video from a SpraySpy® DIN SPEC 91325 measurment of the droplet size and velocity in a spray of a GunPainter pneumatic gun (GunPainter – with friendly support of LacTec GmbH).